5KM (All ages) and 1.6KM (Ages 14 and under). The exception is the relay where each runner runs approximately 1.6KM or 1 Mile. 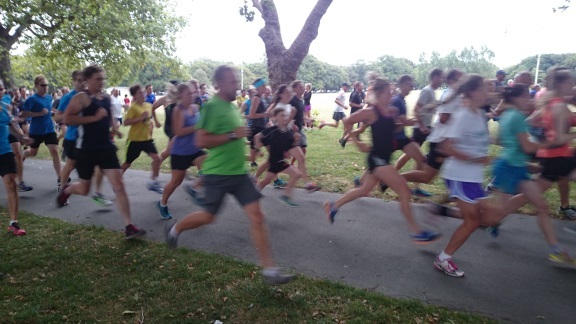 $5.00 (NZ) + Possible $10 One-Off Sanction Fee for the Athletics NZ Sanctioned event at 5:45PM - see below for more details...if you are competing in the 6:15PM fun run/walk event, there is no requirement to pay a sanction fee. To compete in either the 5:45 PM Athletics NZ Sanctioned Event OR the 3 x 1 Mile Relay, anyone who is NOT currently registered with an Athletics NZ Club must pay a one off $10 sanction fee. This $10 will cover your sanction fee for the entire series and you need only pay it once even if you compete on more than one occasion. This is payable per person. For the relay event, if a relay team includes only 1 athlete who isn't a member of an Athletics NZ Club then they are the only person who has to pay the one-off $10 sanction fee. Your details will then be recorded for further events and no further sanction fees are required. This is payable on the night at the registration desk. Entries either online OR on the day up to 15 minutes prior to each event start. No late fees apply.